Team Suzuki Press Office – April 29. Yoshimura Suzuki Factory Racing has signed Toni Elias to race in the team for the remainder of the 2016 MotoAmerica Superbike season. 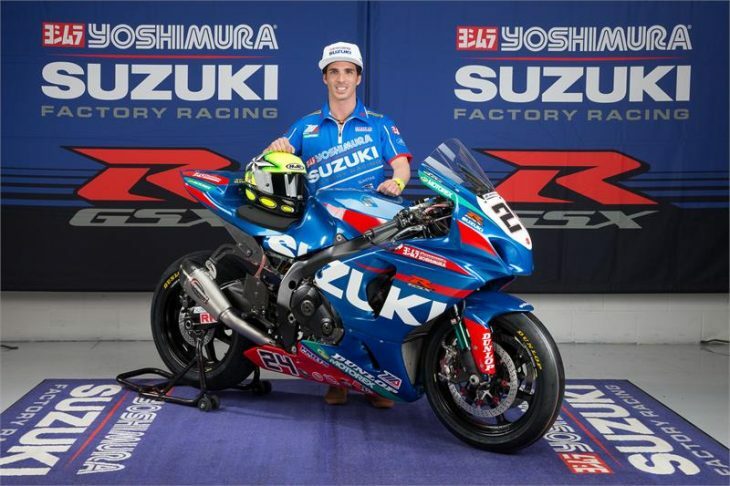 The former Moto2 World Champion created a sensation when he won his first three MotoAmerica AMA Superbike races on a Yoshimura Suzuki GSX-R1000 as a fill-in rider for the injured Jake Lewis. With Elias joining the team, Lewis will move to Team Hammer on an M4 Suzuki GSX-R1000 in the Superstock 1000 class and is expected to return to competition at the Virginia International Raceway round next month. The transition became possible when Team Hammer rider/ owner Chris Ulrich has decided to retire from racing. Suzuki recognised the opportunity for Lewis and began a discussion with the team. For Elias, word that he would stay with Yoshimura Suzuki for the 2016 season was welcome news. After the first four races of the MotoAmerica Superbike season, Yoshimura Suzuki riders Roger Hayden and Elias are first and second in the point standings. Elias made one of the most impressive debuts in AMA Superbike history when he opened his MotoAmerica career with a sweep of the two races at the Circuit of the Americas earlier this month. He followed that up with another victory in race one at Road Atlanta. The 2016 MotoAmerica Championship is at New Jersey Motorsports Park this weekend, April 29th through until May 1st in Millville, New Jersey, for the first of two visits this season to the track.